Personal/Theological Notebook: Loyola Suffers the Death of Fr. Gerald Fagin, S.J. • Personal/Theological Notebook: Loyola Suffers the Death of Fr. Gerald Fagin, S.J. I saw these online today. I think it's a pity that when someone dies, language becomes so inadequate to describing the person lost. I didn't know Fr. Fagin well, only working with him when we swapped classes last spring so that he could teach an undergraduate course on Ignatius of Loyola while I took the Master's class on "Church, Sacraments and Ministry" at the Loyola Institute for Ministry. But in talking over teaching that course with him, I was deeply impressed by his passion for working with students. That impression was reaffirmed in hearing students talk about him. Loyola loses long-time teacher and beloved priest Gerald Fagin, S.J. Heavy hearts are on the campus of Loyola University New Orleans after the loss of Gerald “Jerry” Matthew Fagin, S.J., who died June 14 at the age of 74 after a courageous battle with cancer. Fagin, a member of the New Orleans Province of the Society of Jesus, taught theology and spirituality at Loyola for 33 years, was a Jesuit for 55 years and a priest for 43 years. “Jerry was a man who not only knew the Spiritual Exercises of St. Ignatius, but who also truly lived them in his work, his decision-making and in his life. He was a wonderful person to spend time with. He was insightful and humorous and had a wide array of interests. He truly believed that a person can find God in all things,” said Loyola President Kevin Wm. Wildes, S.J., Ph.D.
To many, he was considered to be a true servant, powerful teacher and living example of Jesuit spirituality. Fagin was in great demand as a spiritual director and devoted many years to developing spiritual formation programs at Loyola and at the Archdiocesan Spirituality Center in New Orleans. “I find it sadly appropriate that this great man passed away at this time of year when we celebrate the feast of the Sacred Heart of Jesus,” said Edward “Ted” Arroyo, S.J., rector of the Jesuit community in Mobile, Ala., and a long-time friend and colleague of Fagin’s. “Father Fagin was a wise, kind and inspiring guide for the Loyola University community and his Jesuit brothers, steeping us all in the Spiritual Exercises of St. Ignatius and steering us in ancient and contemporary ways of following Christ. He will be dearly missed by so many whose lives he touched,” said Fred Kammer, S.J., director of Loyola’s Jesuit Social Research Institute. According to Thomas Ryan, Ph.D., director of Loyola’s Institute for Ministry, through his teaching, preaching, spiritual direction, and leading workshops and retreats, Fagin touched people in many circles in New Orleans and around the world. Fagin was born in Dallas, Texas on April 19, 1938. He graduated from Jesuit High School in Dallas in 1956 and entered the Society of Jesus at St. Charles College in Grand Coteau, La., that same year, pronouncing first vows on August 15, 1958, and remaining in Grand Coteau for his Juniorate (1958-60). He continued studies at Spring Hill College, receiving a Master of Arts in philosophy in 1963, and returned to Jesuit High in Dallas for regency from 1963-66. He then studied at Regis College in Canada where he received a Master of Divinity in 1969, as well as a Master of Theology and a Licentiate in Sacred Theology in 1970. Following priestly ordination on June 7, 1969, at Sacred Heart Cathedral in Dallas, Fagin received a doctorate in theology from St. Michael’s College in Toronto. 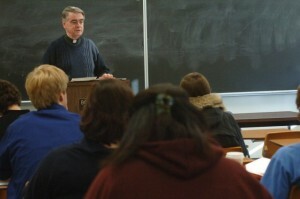 Most of Fagin’s apostolic career was centered at Loyola University in New Orleans, where he began teaching theology in 1973. From 1978-89, he was associate professor of religious studies and was the chair of the Department of Religious Studies from 1981-84. He served as rector of the Loyola Jesuit community from 1984-89, and returned to teaching at Loyola as an associate professor of religious studies from 1991-95. 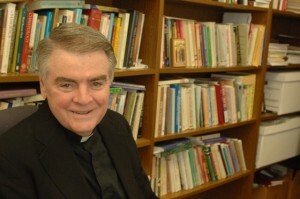 From 1996 until May 2012, he was associate professor of theology in the Loyola Institute for Ministry. Fagin’s publications include “The Holy Spirit” (2002), co-authored with J. Patout Burns, and “Putting on the Heart of Christ” (Loyola Press, 2010), as well as several articles and published lectures. His new book, tentatively titled "God's Dream for You," will be published posthumously by Loyola Press. Fagin was also at work on a major book on spirituality for ministers at the time of his death. Fagin also served the New Orleans Province as superior of collegians from 1974-75, and socius to the novice master at St. Charles College in Grand Coteau from 1976-78. He also held the position of director of studies for the province from 1976-81 and was provincial from 1989-90. Fagin was preceded in death by his parents, Joseph M. and Stella Frain Fagin, both from East St. Louis, Ill., his brother, James J. Fagin, and his sister, Joyce F. Bryant. He is survived by many nephews, nieces and dear friends. Visitation will be Tuesday, June 19, at 7 p.m. at Holy Name of Jesus Church in New Orleans, and a wake service will be held at 7:30 p.m. A Funeral Mass will be celebrated at 10 a.m. on Wednesday, June 20, also at Holy Name of Jesus Church. Interment will follow the Mass at the Jesuit Cemetery in Grand Coteau, La. The Rev. Gerald “Jerry” Fagin, a longtime Loyola University faculty member who wrote extensively about spirituality and the teachings of St. Ignatius of Loyola, died Thursday of cancer at Ignatius Residence. He was 74. Father Fagin moved to New Orleans in 1973, when he started teaching theology at Loyola. During his time there, friends said, Father Fagin’s ability to communicate profound spiritual truths in ways that lay people could comprehend made him a beloved figure. “He had a zeal for the spiritual life and sharing the spiritual life with many people,” said the Rev. Edward “Ted” Arroyo, rector of the Jesuit community at Spring Hill College in Mobile, Ala. “He tried to help people get in touch with their spirit and the spirit of God at work in their lives,” Arroyo said. A native of Dallas, Father Fagin graduated from Jesuit High School there in 1956 and entered the Society of Jesus at St. Charles College in Grand Coteau later that year. He earned bachelor’s and master’s degrees in philosophy at Spring Hill and three degrees at Regis College in Toronto: master’s degrees in divinity and theology and a licentiate in sacred theology. He earned a doctorate in theology at St. Michael’s College in Toronto. At Loyola, Father Fagin was an associate professor of religious studies, chairman of that department and rector of Loyola’s Jesuit community. From 1996 until last month, he was associate professor of theology in the Loyola Institute of Ministry. In 1989 and 1990, Father Fagin was the Jesuit provincial, the leader of the order in a 10-state region stretching from New Mexico to South Carolina. During that period in New Orleans, Ryan said, he brought students from his class at Jesuit High School to the Federal Building to meet the Rev. Daniel Berrigan, who was leading a nonviolent protest after church workers were murdered in El Salvador. Father Fagin’s books include “The Holy Spirit,” which he wrote with J. Patout Burns; “Putting on the Heart of Christ;” and “God’s Dream for You,” which will be published posthumously. A Mass will be said Wednesday at 10 a.m. at Holy Name of Jesus Church, 6367 St. Charles Ave. Visitation will be held Tuesday from 7 to 9 p.m. at the church, with a wake at 7:30 p.m. Visitation will start Wednesday at 9 a.m. at the church. Burial will be in the Jesuit Cemetery in Grand Coteau.